Hyacinth (Hyacinthus orientalis): growing, planting, caring. Very early flowers of all colours. 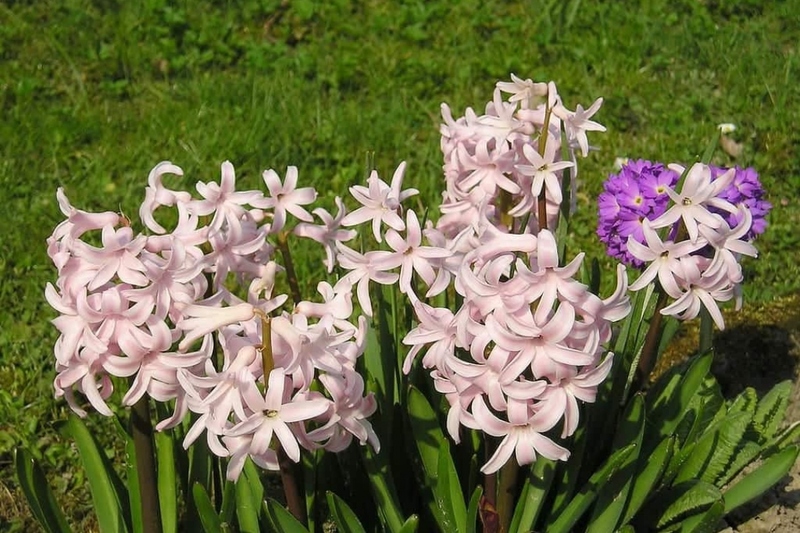 Hyacinthus orientalis - the hyacinth - is a species of flowering plant in the family Asparagaceae, widely cultivated everywhere in the temperate world for its strongly fragrant flowers appearing exceptionally early in the season, even frequently forced to flower at Christmas. They are bulbous plants with a 3–7 cm diameter bulb. Leaves are strap-shaped, 15–35 cm long with a soft, succulent texture and racemes are 20–35 cm tall, bearing fragrant flowers. Over 2,000 cultivars have been selected with shades of blue, white, pale yellow, pink, red or purple. Hyacinthus orientalis bear clusters of flowers in March, of very varied color according to the cultivars. The leaves are slender, and measure from 15 to 35cm. Plant your hyacinths in autumn in a well-drained soil, light, poor, in full sun or partial shade. Bury the bulbs 10 cm deep, and space them at least 5 cm. If you choose to keep your hyacinths in pots, know that they could suffer frost! Use a mix of potting soil and soil, and plant your bulbs, letting the tip visible. Hyacinths in open soil do not need watering; their life cycle is early enough to have already reformed their bulb when the summer drought arrives. In pots, the soil must be kept moist. Take advantage of the summer dormancy to propagate the cloves: using a pitchfork, remove the bulbs: separate the smaller ones, you can even cut in cross the bigger ones, and replant. At the end of flowering, cut foliage after it has become yellow; it is at this moment that the plant as stored its energy for the winter!